This lavishly decorated object is inscribed around the neck: "Made by cUmar ibn al-Hajji Jaldak, the apprentice of Ahmad al-Dhaki al-Naqqash al-Mawsili in the year 623 [1226 A.D.]." Ahmad al-Mawsili, originally from Mosul in Upper Mesopotamia, was a famous metalworker who had a number of pupils. Cylindrical lidded boxes (pyxides) were probably used in the Islamic world to hold ushnan (alkaline ashes of the soda plant which were used for washing). 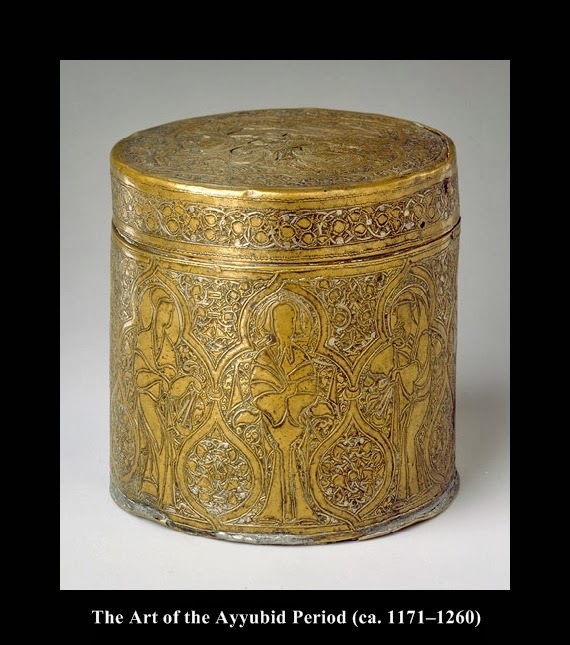 A number of these boxes were produced in the Ayyubid and Mamluk periods (thirteenth and early fourteenth centuries), and this work, which has no inscription, is among a few that present Christian images. The body, entirely filled with vegetal scrolls, is divided into eight lobed medallions, each containing a figure. One medallion shows the entry of Christ into Jerusalem astride a donkey; he is accompanied by two men who are about to throw their garments under the animal's hooves and by two others who carry palm branches. Two angels hold a canopy above Christ's head, an image similar to secular throne scenes in contemporary Islamic manuscripts from northern Mesopotamia. In the medallion opposite the Entry into Jerusalem scene, a holy man is depicted frontally: he wears a chasuble, has a long, bifurcated beard, and holds a large cross. The remaining six medallions are occupied either by a figure holding an incense burner, a supplicant, or a monk. Four of these figures look toward Christ, emphasizing the focus of the composition, while the other two flank the holy man and turn toward him. The Virgin and Child with Saint Joseph are seen on the lid. 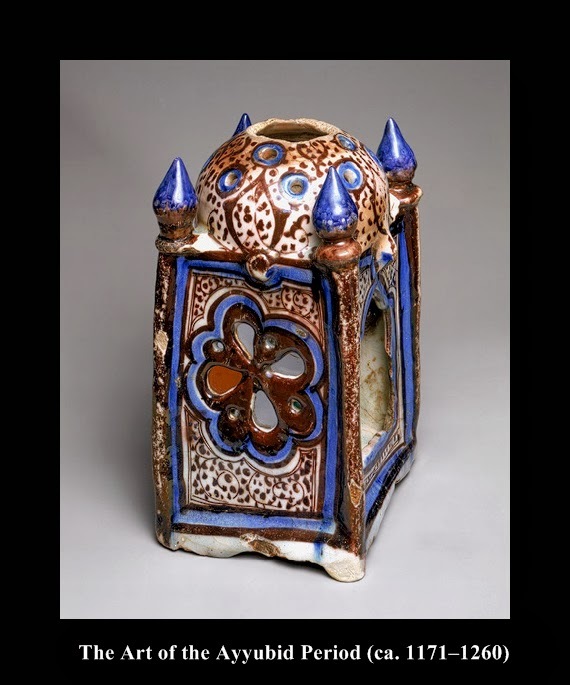 This rare object, a lantern in the shape of a domed square building suspended by means of chains, fits well in the production of vessels decorated in dark brown luster and blue highlights at Raqqa, Syria, during the Ayyubid period. Colorless and colored glass originally filled the two sides presenting lobed rosettes, whereas the other two sides have openings in the shape of trilobed arches. With its hemispherical dome and decorative finials at the four upper corners, the lantern's structure suggests a tomb or mausoleum, thus pointing to a religious or votive function. In the absence of inscriptions that might confirm its significance, however, it may have equally served a secular function. 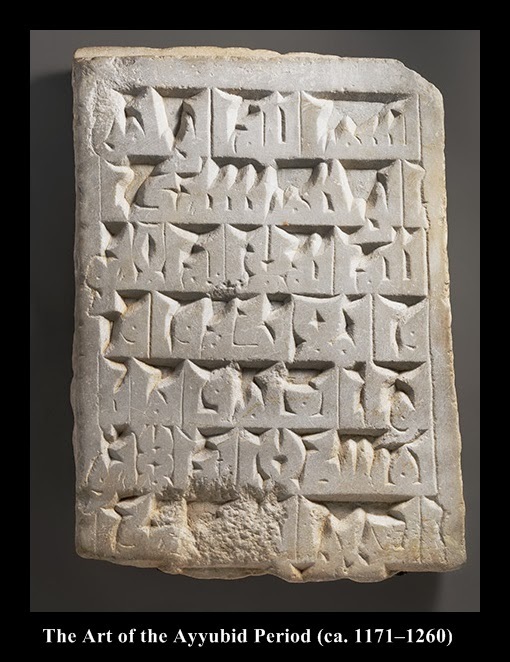 This marble tombstone is carved on both sides: on the side on view, a Qur'anic verse (Sura 3:18) is inscribed in robust kufic script, characteristic of the Fatimid period. More than two centuries later, the stone was reused, again as a tomb marker. It was inverted and carved with an inscription that includes a death date of 1248–49, framed within an arch on columns with rosettes in the spandrels and a lamp suspended from its apex. The Ayyubid dynasty came to power under the leadership of the Kurdish Zengid general Salah al-Din (r. 1169–93), known in Europe as Saladin. After repulsing a Crusader army that had reached the gates of Fatimid Cairo and occupying Egypt on behalf of the Zengids (1160s), Salah al-Din declared the Fatimid caliphate to be at its end, and established the Ayyubid sultanate (1171). Soon thereafter, Salah al-Din also gained control over Yemen (1174) and Syria (1180s). The conflict with the Crusaders continued throughout the Ayyubid period; Jerusalem was captured by the Muslims in 1187, then, following a failed treaty, ceded until 1244, when the city was retaken for good. The sultanate depended on mamluks (slave soldiers) for its military organization, yet the end of the dynasty in 1250 was largely caused by mamluks themselves, who overthrew the last Ayyubid sultan in Egypt, al-Malik al-Ashraf (r. 1249–50) and founded the Mamluk sultanate (1250–1517). In the arts, the Ayyubids are known especially for their works in inlaid metalwork and ceramics, particularly luster- and underglaze-painted wares. Some objects from this period, including a group of inlaid metalwork pieces, also have Christian scenes. Signatures of artists on refined and prized brass works inlaid with silver seem to indicate that the craftsmen were from Mosul (in present-day Iraq) and had fled from the approaching Mongol armies. 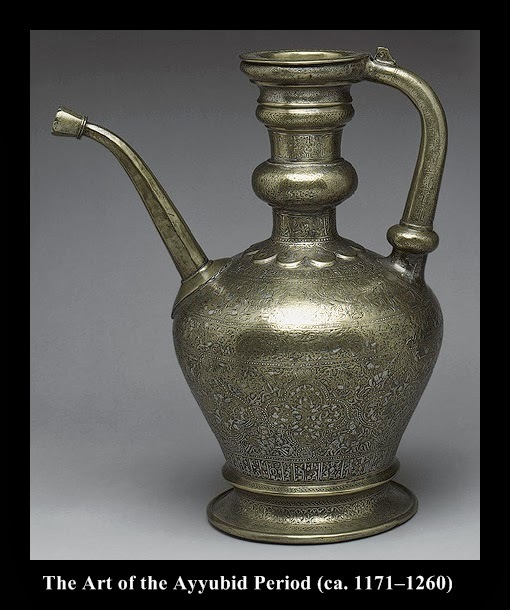 In the case of ceramics produced in Syria, the influence of Seljuq Iran is prevalent. Among other arts, enameled glass rose to excellence in this period and carved wood was also esteemed by Ayyubid patrons. Techniques established and developed during this time formed the foundation of the arts in the Mamluk period. The Ayyubids were also vigorous builders. Their generous patronage led to tremendous architectural activity in Egypt and especially in Syria, and their local courts revived the cities of Damascus and Aleppo. The outstanding secular architecture from this period includes the fortified citadels of Cairo (1187) and Aleppo (early thirteenth century). Meanwhile, the establishment of madrasas, higher institutions for religious learning, such as the Zahiriya (1219) in Aleppo and that of Salih Najm al-Din Ayyub (1243) in Cairo, exemplify the Ayyubid interest in Sunni education after the Shici interlude in the region under the Fatimids. Furthermore, the Madrasa al-Sahiba in Damascus (1233), built by Salah al-Din’s sister Rabia Khatun, as well as the Mausoleum of Salih Najm al-Din Ayyub (1250), commissioned by his wife Shajarat al-Durr, reflects the importance of women as patrons of architecture under the Ayyubids. In terms of commemorative buildings and pious architectural initiatives, the Mausoleum of Imam al-Shafici (1211) and the Tomb of the cAbbasid Caliphs (1242–43) in Cairo are especially noteworthy.